Genesis Sonic the Hedgehog (World,r1) "no zips" in 17:36.58 by Aglar. Fast bouncing around. This is a run of Sonic the Hedgehog which avoids zipping (gaining a large speed boost from being inside terrain), unlike the other run of this game. Therefore, most levels cannot be skipped, and instead have to be traversed using a more normal route, although the author still finds a couple of alternative methods to take shortcuts (it is hard to define hard rules to ban all glitches). 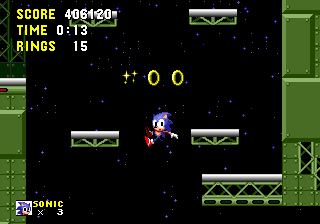 In this run, the game is completed without collecting the Chaos Emeralds. There are also runs where Knuckles and Tails they take advantage of their own abilities to finish the game in record time.